Lisa Dreher is Director of Marketing for Kymeta where she leads marketing for its disruptive satellite product and global mobile services. “Sixty years ago, Dwight D. Eisenhower was the U.S. president, Elvis Presley released the single “Jailhouse Rock,” Mickey Mantle hit his 200th career home run, Congress passed the Civil Rights Act of 1957 and the USSR launched Sputnik I, the first artificial Earth satellite. Having been in the technology and communications industries for over 25 years, I’ve seen a lot of changes, but none as earth-shattering as what we are on the verge of now. The 60-year-old satellite industry is currently facing four major shifts that we cannot afford to ignore, as they will have a drastic impact on the way we communicate. Making mobile communication available everywhere: No roaming, no dead zones and no borders are certain to drive broad adoption. For communications professionals, this means a mobile-first strategy will become even more critical than it already is. Connecting people that have never been connected: No towers, no hard wires and no distinction between metropolitan markets and rural and isolated areas means more people around the globe will have access to broadband internet and therefore the global economy. Communications professionals must take an even broader perspective on potential audiences and market opportunities while balancing global compassion and awareness. Addressing congestion: Networks bogged down by the number of users and high-demand video and gaming applications will be a thing of the past. Limited capacity of wireless mobile networks won’t be an issue, even when tens of thousands of fans gather for a sporting event. Augmented and virtual reality applications present an opportunity for communications professionals to engage with consumers in meaningful ways wherever they go and however they get there. 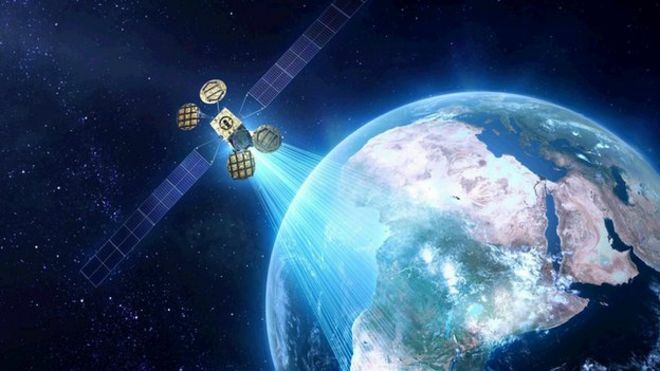 Making broadly available mobile communications possible: No gimbals, no moving parts and no complicated set up will make satellite, in combination with 5G, the hybrid solution of choice for a broad set of mobile applications and will spur on a new set of business opportunities. This means better tracking, on-demand and streaming information and entertainment. The use of satellite communications has been limited to fixed uses; for example, direct-to-home (DTH) applications like satellite television. This use case represents about 77% of satellite communications revenue. The use of satellite for mobile communications has been limited. The size, cost and complexity of these systems have severely stifled the adoption of satellite for mobile applications. In fact, mobile applications represent less than 3% of global satellite services revenue today. Those of us in the satellite industry are witnessing significant changes that will dramatically change the way the world communicates. First, satellites are getting smaller. This means satellites are less expensive to build and more can be launched on a single rocket. Rocket launches are increasingly cost-effective. The advent of reusable rockets is a cost-saving revolution. Lower launch costs and lower cost satellites are leading to more satellite launches. This means there will be even more communications capacity available via satellite. Most communications satellites are geosynchronous and can have latency challenges. They also travel around the earth’s equator, making connections far north or south of the equator challenging. New communications satellites called low earth orbit (LEO) satellites will circle the earth and take a longitudinal orbit path. These new satellite constellations will provide much lower latency and effectively cover every bit of the earth’s surface. The significance of these changes cannot be overemphasized for the communications industry. The last remaining gaps will be filled and addressed. A hybrid approach will bring more people from every corner of the world into the global economy, necessitating a broad view and a mobile-first approach that leverages AR, VR, streaming and on-demand approaches. With so many people spending most of their time in urban centers in the world, it is easy to forget that a smartphone doesn’t equal connectivity. Despite all the places we are connected, 60% of the earth’s population still doesn’t have access to any form of high-speed internet and 32% of the earth’s population doesn’t have LTE coverage. Plus, 1.6 billion people don’t have access to mobile networks — and this includes people living in industrialized nations. These dramatic figures demonstrate how making connectivity and the global marketplace available to everyone, everywhere will also dramatically impact how, when and where we communicate with our customers and partners. Now is the time to start imagining and planning for these opportunities and complexities. This 60-year-old industry is experiencing a rebirth due to technological advances that will allow satellite communications to provide broadband internet access where it has never been before.